A pea, although treated as a vegetable in cooking, is botanically a fruit; the term is most commonly used to describe the small spherical seeds or the pods of the legume Pisum sativum. This was the original model organism used by Gregor Mendel in his early work on genetics. The name is also used to describe other edible seeds from the Fabaceae like the pigeon pea (Cajanus cajan), the chickpea, the cowpea (Vigna unguiculata)and the seeds from several species of Lathyrus. P. sativum is an annual plant. It is a cool season crop, planted in winter. The average pea weighs between 0.1 and 0.36 grams. The species is as a fresh vegetable, but is also grown to produce dry peas like the split pea. These varieties are typically called field peas. P. sativum has been cultivated for thousands of years, the sites of cultivation have been described in southern Syria and southeastern Turkey, and some argue that the cultivation of peas with wheat and barley seems to be associated with the spread of Neolithic agriculture into Europe. It is a cool-season vegetable crop. The seeds may be planted as soon as the soil temperature reaches 10 °C, with the plants growing best at temperatures of 13 °C to 18 °C. They do not thrive in the summer heat of warmer temperate and lowland tropical climates, but do grow well in cooler high altitude tropical areas. 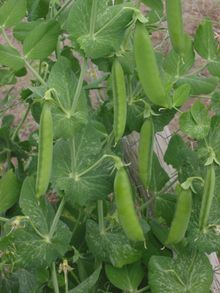 Peas grow best in slightly acid, well-drained soils. The seeds are dispersed when the pod reaches maturity and bursts open. It scatters the peas over as wide a distance as it is possible for the plant. Fresh peas are often eaten boiled and flavored with butter and/or spearmint as a side dish vegetable. Salt is also commonly added to peas when served. Fresh peas are also used in pot pies, salads and casseroles. Pod peas (particularly sweet cultivars called mangetout and sugar peas, or the flatter "snow peas," called hé lán dòu, 荷兰豆 in Chinese) are used in stir fried dishes, particularly those in American Chinese cuisine. Pea pods do not keep well once picked, and if not used quickly are best preserved by drying, canning or freezing within a few hours of harvest. Dried peas are often made into a soup or simply eaten on their own. In Japan and other Southeast Asian countries including Thailand, Taiwan and Malaysia, the peas are roasted and salted, and eaten as snacks. In the UK, marrowfat peas are used to make pease pudding (or "pease porridge"), a traditional dish. In North America a similarly traditional dish is split pea soup. In Chinese cuisine, pea sprouts (豆苗 dòu miáo) are commonly used in stir-fries and its price is relatively high due to its agreeable taste. Some forms of etiquette require that peas be only eaten with a fork and not pushed onto the fork with a knife . Bianchini, F. & Corbetta, F., 1976, The Complete Book of Fruits and Vegetables. New York : Crown Publishers, Inc. ISBN 0-517-52033-8. European Association for Grain Legume Research (AEP). Pea. .
Muehlbauer, F. J. and Tullu, A., (1997). Pisum sativum L. Purdue University . Oelke, E. A., Oplinger E. S., et al. (1991). Dry Field Pea. University of Wisconsin . Oregon State University (OSU). (2006). Green Peas, Garden Peas, Peas. . This page was last changed on 25 January 2019, at 20:43.